When minimum signal loss in a transmission line is required for maximum power transmission between the receiver and/or transmitter, nothing come close to waveguide. Waveguide is very expensive and for frequencies below a gigahertz or so, very impractical (or even impossible) due to the required physical size. It has the advantage, too, of being nearly impervious to outside interference or leakage to the outside, and it can handle extremely high power levels. Waveguide can be installed in almost any manner and anywhere without concern for signal disruption. Its biggest vulnerability is probably arcing due to contaminants within when the system has not been purged of humid air and backfilled with a gas such as dry nitrogen. Coaxial cable has many advantages of waveguide, but is less expensive and easier to install and maintain. It biggest negative is relatively high signal attenuation unless very large gauge inner conductor sizes are used - which adds to expense and handling difficulties. In-between is twin lead transmission line (including ladder line). At frequencies up through about a gigahertz, properly installed twin lead line has after a quarter or less of the loss of "normal" size coaxial cable, but more than waveguide would have if available. In the days of rooftop television antennas, twin lead was very inexpensive, even for the high-end foam-filled stuff. Twin lead's biggest drawback by far is its sensitivity to routing near obstacles (buildings, dirt, towers, etc.). If you are old enough to remember twin lead cable running from the roof of your house to the TV, then you know of what I write. 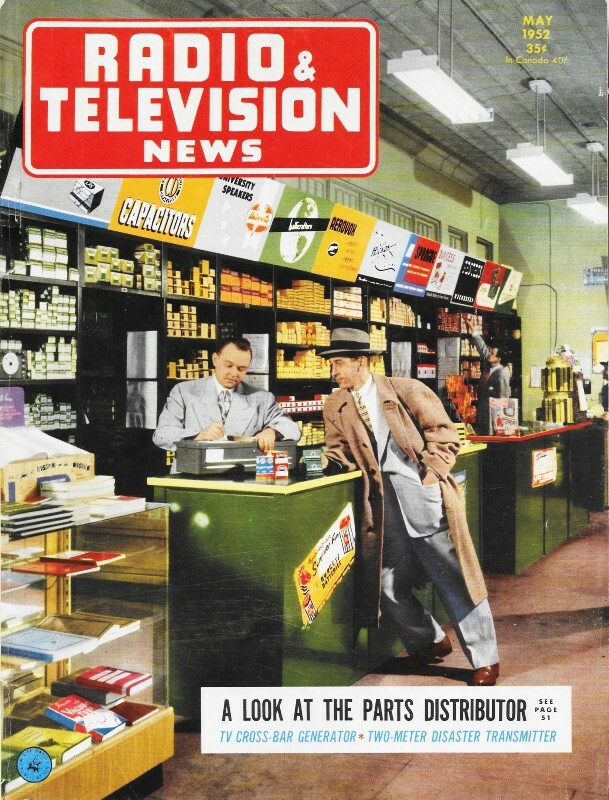 A. discussion of the principal considerations involved in selecting and installilng TV lines. Fig. 1 - Federal Telephone's recently developed 300-ohm shielded television cable. Fig. 2 - A 300-ohm twin-lead with leads separated by polyethylene. Fig. 3 - Reflections appearing as ghosts or multiple images caused by line mismatch. Because of the complexity of the TV receiver itself and the variety of available antennas, these two items are usually the main considerations in installing a TV receiver. 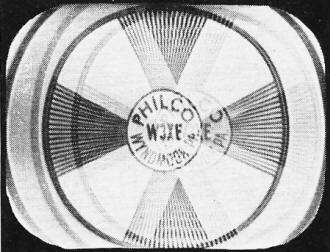 The proverb about the weakest link in the chain applies to television, especially in the case of the transmission line from the antenna to the receiver which is often the weakest link and therefore, a source of trouble. As the name indicates, the transmission line transmits the signal from the antenna to the receiver, but it is more than just a set of wires carrying electricity. It is our purpose to show the electrical characteristics, function, and requirements of television transmission lines together with their limitations and corrective measures. Fig. 4 shows the electrical circuit of the antenna and the TV receiver input as well as the transmission line between the two. The antenna can be considered as an a.c. generator with an internal impedance RA which works into a load RL. 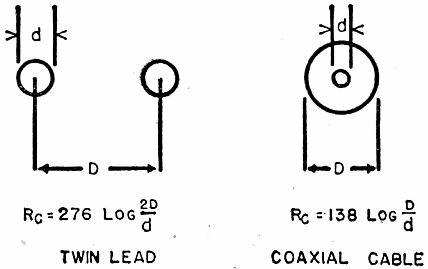 The transmission line then has the function of delivering the output of the antenna to the load with a minimum of losses and distortion. To get maximum power transfer the internal impedance of the transmission line must equal that of the generator and, at the receiver end, that of the load. In other words, we must have correct impedance match both at the antenna and at the receiver to get maximum efficiency from this system. It is easy to see that in a weak signal area this efficiency can make the difference between a usable or unusable signal. Another effect of improper impedance match is reflections on the line which will be explained in detail later. These reflections appear as ghosts or multiple images on the screen and may be strong enough to completely ruin the picture as in Fig. 3. Excessive attenuation also results in weak pictures and must be avoided, especially in fringe areas. power and have no reflections. In the case of the twin-lead shown in Fig. 2, 300 ohms is the characteristic impedance and when this line is terminated by a 300 ohm resistor it will deliver maximum power and have no reflections. and therefore no standing waves on the line. One formula for RC is given in Fig. 5, another makes use of the physical dimensions of the line as shown in Fig. 6. Where physical dimensions are concerned, a considerable difference exists between twin-lead and coaxial cable and a further variation depends on the type of insulating material used. Polyethylene, the material used for most TV lines, has a dielectric constant which is more than twice as high as air. Open wire lines must, therefore, have wider spacing between wires than those molded in polyethylene. Fig. 4 - RF transmission line in system. Fig. 5 - Twin lead distributed element circuit model. Fig. 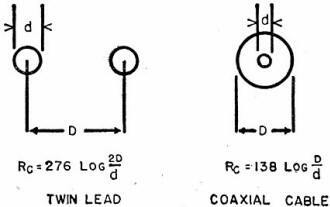 6 - Physical dimensions of twin line and coavxial cable. Fig. 7 - Standing waves on transmission lines. Fig. 8 - Transmission line tuning stub. When a transmission line is terminated in anything but its characteristic impedance, some of the signal sent through it will be reflected back from the improperly terminated end. That this comes about can be proven mathematically and the truth of this statement verified experimentally. These reflected signals are usually out-of-phase with the original and therefore reduce the original signal strength at the receiving end. Another explanation for the loss in signal at the load is that when some of the transmitted energy is used up in reflections, less is available at the load. The reflected signal, together with the original signal, keeps up a constant field around the transmission line, because each successive cycle produces the same reflection, and again the same instantaneous field. The total effect is that of a constant r.f. field of a pattern like that shown in Fig. 7. The distance between successive points of maximum or minimum is half the wavelength of the transmitted signal if the line is of the open-air type. If polyethylene is used, the distance between these peaks and valleys will be slightly less than half the wavelength. The Greek letter lambda (λ) in Fig. 7 is the conventional symbol for wavelength. In laboratory procedure it is possible to get a better picture of this standing wave field by using a fairly strong r.f. signal and placing a small antenna probe and diode rectifier near the line. The rectified r.f. is then measured and by setting up a ratio between the voltage obtained at a maximum and at a minimum point, the standing wave ratio is obtained. Thus if the s.w.r. is close to 1, this indicates that the line is terminated properly and no reflections take place. In television work it is desirable to get an s.w.r. as close to 1 as possible and practical values will range from about 1.05 to 1.2. Up to now we have assumed that the transmission line is composed entirely of inductive and capacitive elements and therefore would not have any dissipation. Although most types of TV lines have a fairly small d.c. resistance due to the copper conductors, some dissipation is encountered in every transmission line. By that we mean the loss in power due to heating up the copper conductors and the losses due to the dielectric between conductors. In the average TV installation these losses are negligible, but where lengths of 1/2 to 1 mile are concerned the dissipation losses present a serious problem. One way to overcome them is by means of open-wire lines. To reduce the d.c. copper loss the conductors are of larger size and to minimize dielectric losses the two wires are kept several inches apart by means of low-loss polystyrene spacers. Such a transmission line must be well removed from all grounded objects and suspended with suitable insulators. The standing-wave pattern, shown in Fig. 7, holds true only for a line having no dissipation and such a line, is not practically feasible. Therefore, the effects of dissipation on the standing-wave pattern must be considered, even though, just like the actual losses, this effect will be slight for TV transmission lines. Since the losses in the line reduce the signal strength as it travels down the length of the line, the reflected signal will also be reduced. For a line having considerable dissipation the standing-wave pattern will not be constant as shown in Fig. 7, but the height of each maximum point will be slightly less than the one before as the pattern progresses towards the sending end. On very long lines this means that while the s.w.r. may be quite high at the improperly terminated receiving end, it may be negligible at the transmitting station. When specifying s.w.r. for longer lines the distance from either end of the line should be given. If a transmission line has exactly the same length as some multiple of the wavelength of the signal, we speak of a "tuned" line. The effects of such a tuned line length are quite similar to the effects of resonant or tuned circuits at the resonant frequency. The shortest multiples of the wavelengths which are practically usable are the quarter and half wavelength sections. A shorted half wavelength of transmission line or an open quarter wavelength act just like a series resonant circuit. Their input impedance is zero at the resonant frequency and they represent an effective short circuit to signals of that wavelength. A shorted quarter wavelength or an open half wavelength, however, act just like a parallel resonant circuit. Their impedance at the resonant frequency is very high. These particular characteristics of transmission lines are quite useful in television work. One more aspect of transmission line theory merits discussion here because of its use in TV installations, that is, the impedance matching action of a quarter wavelength of line. When it is desired to match different impedances, transformers are used in circuit work. In transmission line networks, a quarter-wave matching stub serves the same purpose. While in ordinary circuits the matching action of the transformer depends mainly on the turns ratio, the characteristic impedance of the matching stub is the critical factor here. As shown in Fig. 8, this characteristic impedance, Rst, is the square root of the products of the two impedances to be matched. Assume that a 50-ohm antenna and a 300-ohm line are to be matched. Rst equals the square root of 15,000 which turns out to be 122.5 ohms. Since the nearest commercially available value is 150 ohms for twin-lead, this can be used and a slight mismatch must be tolerated. The alternative would be to make up an open wire stub according to the formula in Fig. 6. By simple algebra we obtain the value of 2D/d, then we need only select a convenient wire size for d and adjust the spacing D accordingly. It should be noted that this impedance matching is not applicable to a broad band of frequencies, just as most high gain antennas are not equally effective on all TV channels. In most instances where separate high- and low-band antennas and lead-ins are used, the matching stub can be designed for the center frequency in each TV band. To use a single matching stub for both TV bands would hardly be useful since the mismatch at the off frequencies would be just as great as without the stub. d. Interference picked up by the antenna or line. Foresight being better than hindsight it is wise to plan the installation in advance and try to avoid all of these defects. The most important item in that respect is the choice of the antenna and transmission line to match the input impedance of the receiver. Most modern sets have a 300-ohm input or else have provision for either 72- or 300-ohm input by means of a coupling transformer mounted near the tuner. 52-ohm input is rare, but some older receivers may have it. To match these impedances the most common type of line is the 300-ohm, ribbon-type, twin-lead. Coaxial cable comes in 72- and 50-ohm types and is often preferred over twin-lead because of its shielding effect against ignition and other noise. Recently, a special 300-ohm, shielded cable was made available by Federal Telephone & Radio Corp. This cable is shown in Fig. 1, and has the advantage of the 300-ohm impedance, combined with the shielding effect of the outer copper braid. When this type of line is used connect the two inner conductors to the antenna terminals and connect the shield to the chassis by means of a 0.1 μfd. condenser. This eliminates the danger of shorts should the chassis be connected to the power line. In addition to selecting the correct transmission line, the selection of the best antenna is quite important. The choice of antenna, however, will be guided by reception conditions, number of channels to be received, reflections, etc., rather than by impedance considerations. As a result, the impedance of the antenna is often quite different from that of the line. A few types such as the folded dipole, conical, and other broadband antennas have an impedance approaching 300 ohms. Most of the high-gain, narrow-beam types have impedances varying from 10 to 75 ohms. It is possible to get a higher impedance when the antenna connections are made a little further from the center, but this has the effect of loading the antenna and often cannot be done. The best procedure is to find out the nominal impedance of the antenna to be used from the manufacturer's data and then design a matching stub accordingly. As mentioned before, a separate matching stub for each TV band is a necessity and the ideal, of course, would be to have a separate antenna and matching stub for each channel. To keep the dissipation losses to a minimum and the efficiency of the system high, mount the transmission line well away from walls, gutters, and pipes, especially where twin-lead is used. The mounting studs should contain either porcelain or polyethylene to avoid further capacity to ground. Never use regular electrician's tape or paper tape on twin-lead since they have a much lower dielectric constant and therefore increase losses. Only poly-tape or a good grade of cellophane tape should be used. Another "don't" concerns the practice of concealing twin-lead near a molding, tacking it on and eventually painting over it. Invariably tacking and especially painting will completely wreck the impedance and dissipation characteristic. Once an installation is made and exhibits some of the defects due to incorrect transmission line impedance or excessive losses, the remedy is naturally somewhat harder. To make sure efficiency is really down it would be necessary to install a new and properly matched line, unless it is possible to measure the signal strength at the antenna and again at the receiver. A loss of more than 20% for a 50 foot length would certainly be excessive. It is often possible to determine by inspection whether the impedance of the antenna is matched and whether a match exists at the receiver. To check for standing waves simply grasp the line in one hand and slide the hand along the line over at least five or six feet and observe if the picture changes as this is done. If the picture shifts, ghosts move, or the signal strength changes, standing waves are present and improper impedance match exists. The effect of "tuned" transmission line lengths can often be used to eliminate interference before it reaches the TV receiver. As was shown earlier, a quarter-wavelength open line or a half-wavelength shorted line represents a short circuit at the resonant frequency. If, therefore, such a length were connected to the antenna terminals of the TV set, the resonant frequency would be shorted out, but other signals would not be affected too much. A good example would be the case of FM interference from a station at about 108 mc. which could be received by beating with the local oscillator set at 83 mc, and the receiver tuned to Channel 3. Connecting an open circuited quarter-wavelength section of transmission line at the antenna terminals would make this a short for the interfering signal. At the desired TV signal, however, this would be much less than a quarter-wavelength and would represent a high impedance. In practical applications the exact wavelength of the interfering signal need not be known, but only an approximate idea of it is necessary. Cut the open circuited stub longer than necessary and connect at the receiver. Then cut off 1/2 inch lengths until the interference is eliminated. There is nothing mysterious about the behaviour of transmission lines and once the basic theory of this subject is understood the technician will find many applications in designing new installations and improving the performance of existing ones. Although not an active circuit element, the transmission line between the antenna and the receiver is a vital link in the over-all operation of TV reception.